Let’s face the facts. I like beer, specifically craft beer. Whenever I’m on vacation I drink locally made beers and seek out where they are made. Luckily, Cindy humors me. It will be no surprise then that we spent an afternoon at the Maui Brewing Company production facility; taking their tour and enjoying some fresh Maui beer. First off, we should get to the logistics. The production brewery is in Lahaina on Maui’s northwest side, just a few blocks off of Front Street, on the east side of the highway at 910 Honoapiilani Highway #55. (See Map) If you are looking for it, you won’t want to confuse its location with their brewpub which is 6 miles north at 4405 Honoapiilani Highway #217. (See Map) The tour costs $10 and includes a 30-45 minute education on the Maui Brewing process, a 6 sample taster tray, and a token for a free pint at the brewpub. They offer two tours on Friday’s (3pm and 4pm) and three on Saturday’s (10:30am, 11:30am, & 12:30pm). Reservations can be made by calling the Tasting Room at 808.661.6205 during normal hours. We started off in the Hawaiian appointed tasting room which is in the warehouse facility. Behind the bar, Ann was quick to welcome us and get us all setup for the tour. We were about 15 minutes early, so Ann recommended that we start it off right with one of our two sampler trays. It was a good call! 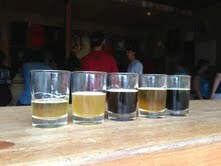 The sampler included the regulars: Bikini Blonde, Manna Wheat, the amazing Coconut Porter, and Big Swell IPA. It also included as one seasonal the Aloha B’ak’ton brewed with 40lbs of chocolate for the Mayan Apocalypse. I’m so glad zombies didn’t end the world and I got to taste this wonderful beer with roasted malted aroma and dry dark chocolate bitter finish. We sat around and chatted with a couple from Tulsa whom I invited to write a post about Tulsa Beer, hopefully they will take me up on it. It wasn’t long before Buck led us back to show us the 25 barrel brewing facility where all of Maui Brewing’s canned and kegged beers are produced. It was the typical brewery tour, walking you from the beginning of the process from grain and hop selection, through the mash tun, the boil kettle, the fermenters (They have 9 100bbl fermenters), and on to the canning and kegging. It differentiated from other tours when talking about sustainability, Maui ingredients, and the process for getting that wonderful coconut flavor in the Coconut Porter. The mission at Maui Brewing is to put a little bit of Maui in every beer. That’s why you’ll find Maui pineapple in their Manna Wheat, and the Coconut in their Porter. Every Maui Brewing beer is made in Maui, and they pledge to keep it that way. They do all they can to ensure quality and taste of their canned beer, no matter where it is, and tweak the recipes for the best product. Maintaining the Maui flavors on the mainland can be a challenge due to the freshness of the Aloha ingredients. Unfortunately, this means that they are only distributing in select markets in eight additional states. Fortunately, Seattle is one of those markets! When Buck’s brilliant tour ended, we headed back to the tasting room where Awesome Ann was waiting for us with our second sampler tray. The beers all seemed to taste a little better after 40 minutes in the warm brewery. We sipped these down pretty fast and ordered up a couple of pints. After yakking with Ann for a while (and some dude from San Diego), and passing on last call, we settled up and continued on with our day. I know when you are in Maui, the last thing you will probably want to do is go in to a warm warehouse with all sorts of machinery, and many different smells. However, if you like good beer and are even slightly interested in learning the brewing process I assure that you will enjoy the Maui Brewing tour. There is even a little liquid gold at the end. Up next will be the brewpub. Spoiler, we’ve already been there, and highly recommend it.